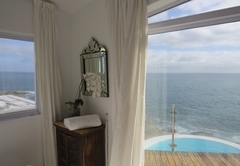 Villa On The Rocks is a highly recommended property providing self catering in Llandudno for up to 10 guests visiting the Atlantic Seaboard region. 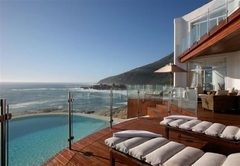 The most beautiful beach villa in Cape Town - Llandudno beach being one of Cape Towns most beautiful beaches. 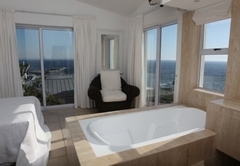 Situated on Llandudno beach with the ocean breaking below this magnificent 5 bedroom double storey villa in Llandudno, Cape Town. 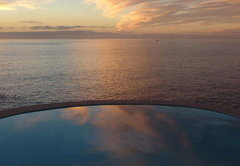 The most incredible beach, ocean and sunsets views! 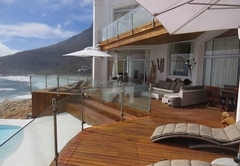 The Villa has the perfect position and elevation surpassing any place in Cape Town. 5 minute walk along a coastal foot path to the beach. 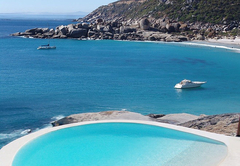 There is a natural looking pool built on a huge granite boulder with a vertical drop to the ocean. Timber deck around the pool with out door furniture and sun lounges for the ultimate sun fun relaxing a time, no need to go any were! Just soak up the natural beauty around you!!! 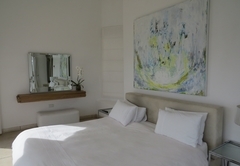 • The villa offers yacht style architecture with all 5 bedrooms facing the sea. 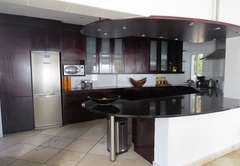 • Large kitchen , dining and lounge all facing onto the pool, ocean and beach. 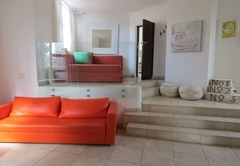 • Air-conditioning and under floor heating through out the villa. 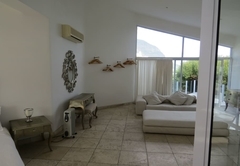 • Brand new kitchen, entrance to villa , marble floors, marble bathrooms and timber decking. • Satellite T.V. 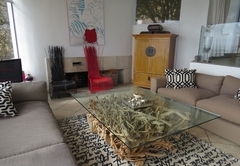 in 4 bedrooms plus a large TV room which is ideal as a sixth bedroom. 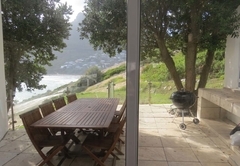 • Double lock up garage and plenty of parking on property. 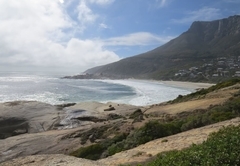 Camps Bay is a 10 minute drive, the City 15 minutes, Hout Bay Village and Harbour a 5 minute drive. 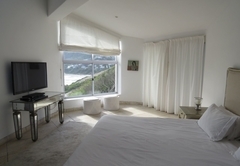 The villa offers yacht style architecture with all 5 bedrooms facing the sea. 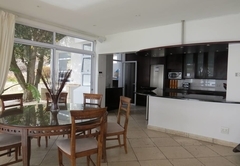 Large kitchen , dining and lounge all facing onto the pool, ocean and beach. Wow! 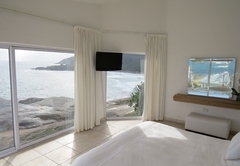 Amazing view from living room and master bedroom. 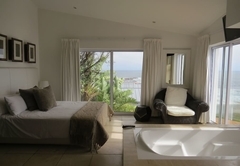 Has a lovely relaxing ambience which makes you feel at home straight away. 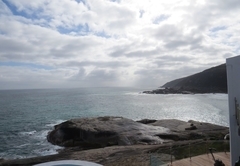 We are 9 people from Germany and we had a plessant stay in Villa on the Rocks from End of October till 4th November 10. The Villa is a little older but still good looking. 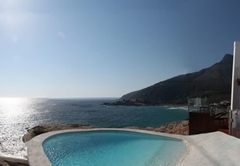 The pool and the panorama is really fantastic. We had some smaller probs like dining table was only up to 8 persons and not every bedroom has had its own bathroom. 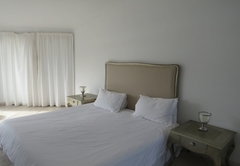 There were many possibilities to sleep - many beds - but only two rooms had a masterbed - kingsize. 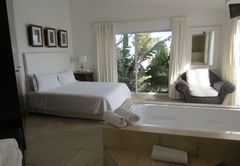 The other rooms had smaller beds, not really made for two larger people to sleep in much compfortable. 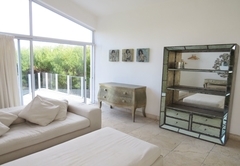 A perfect Villa for 8 persons! Clean, nice style and comfortable - come in and feel home! Bongi was always a friendly and nice person and also the young man for the garden and the pool. We enjoyed our stay very much! Thanks a lot!